It’s the sort of car that any self-respecting secret agent would be proud to be seen in.The secret of the car is hydrofoil, a nautical technology used to lift the hull of boats from the water to increase speed. But the Splash has adapted the method for serious elevation. The body of the “Splash” is watertight and special buoyancy chambers provide extra lift. The car impressed viewers at the Geneva Motor Show and is set to be a hit with concept car fanatics worldwide. This high-speed amphibious sports car can swim, hover above water and it’s no slouch when it comes to flat-out speed either. 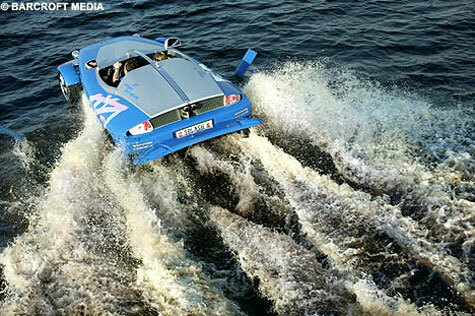 At the push of a button a hydraulic mechanism transforms the sports car into a propeller-powered boat. 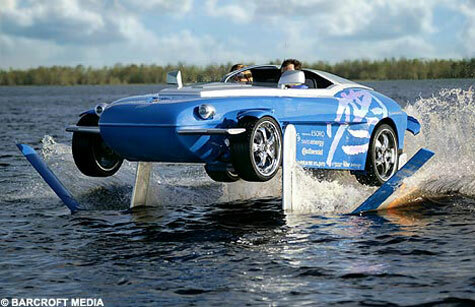 Then an integrated ‘hydrofoil’ system lifts the car to ‘fly’ two foot above the water’s surface. The Rinspeed Splash was created by Swiss genius Frank M. Rinderknecht, 48, at his car company Rinspeed. Frank says: “It’s much more than an agile and lively sports car. It’s a really cool and fun sports toy. “It can reach 125mph on the road and accelerates to 60mph in 5.9 seconds.” The water performance is impressive too, with the Splash reaching an impressive 45 knots. “That’s fast enough for water skiing or knee boarding,” said Frank. The secret of the car is hydrofoil, a nautical technology used to lift the hull of boats from the water to increase speed.